Come watch the live taping of EDIT’s Community Spotlight Podcast! 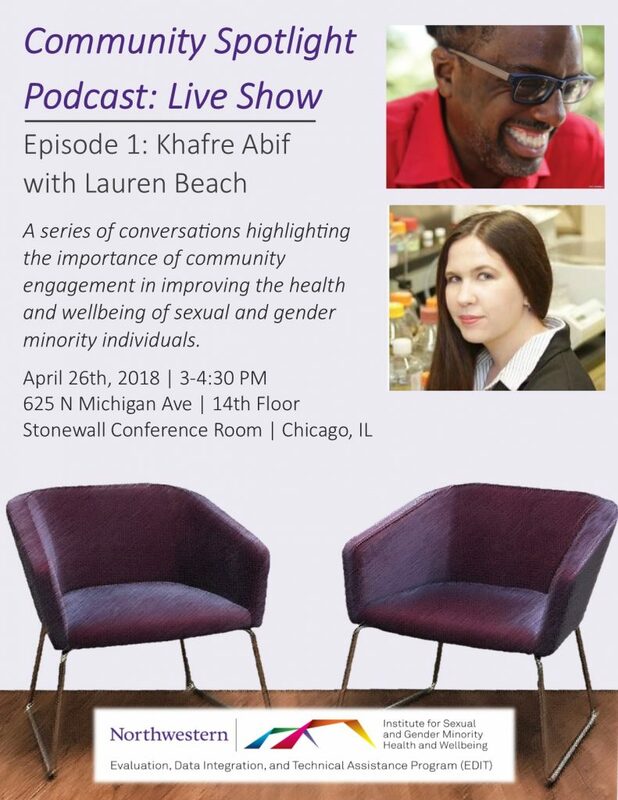 EDIT‘s Community Spotlight Podcast will feature a series of conversations highlighting the importance of community engagement in improving the health and wellbeing of sexual and gender minority individuals. Libations will be served. This event will also be live streamed via Periscope on the EDIT Twitter. Khafre is an Atlanta-based AIDS & Bisexual activist, writer, editor, blogger, and artist who has been thriving with HIV for 29 years. Khafre, now a Community Organizer with the Southern AIDS Coalition, has been honored by HIV Plus magazine as #15 on their list of the 75 Most Amazing People Living with HIV in 2016 and by POZ magazine as one of The 2015 POZ 100: Celebrating Long-Term Survivors. Khafre has independently published Cornbread, Fish and Collard Greens: Prayers, Poems & Affirmations for people Living with HIV/AIDS and Sistah’s Speak: an anthology of short fiction, poetry, creative nonfiction, personal narratives, critical essays and visual art from women living with HIV/AIDS. Lauren is an EDIT Program Postdoc who, prior to joining Northwestern, served as the Director of LGBTI Research at Vanderbilt University Medical Center. From 2014-2015, she was an HIVCorps Public Health Fellow at the Center for Infectious Disease Research in Zambia (CIDRZ), in Lusaka, Zambia. Lauren is a founding member of the Bisexual Research Collective on Health (BiRCH). At the invitation of the Obama administration, she has spoken at the White House to present recommendations for improving bisexual health outcomes and bisexual data collection methods.